I've been trying my hardest to ignore the Star Wars mania sweeping our household. But Argy and Bargy are obsessed. The house is littered with Lego re-enactments and dioramas (imagine Sir Alec Guiness with a removable yellow head and legs that yield only from the hip and you get the picture). Every rolled up newspaper is a light sabre; the cat is a wookie and the Dark Side is no longer just southern wall of the house where only moss grows. I fear we passed the point of no return when it became acceptable to refer to me as Jabba The Hut. Unfortunately the boys' knowledge of the characters and story lines far outstrips my hazy recollection of a bunch of cuddly ewoks running about on the silver screen. I was completely sunk once I realised that the trilogy of my youth, was in fact a mere sequel to a longer, more complicated storyline. A storyline my children have somehow consumed and digested faster than than a kilo of sweets. Today, for example: Argy asked me if I recognised what he was. I had to admit that Boba Fett (who??) did not spring to mind. There was eye rolling, tut-tutting and exasperated exhaling. 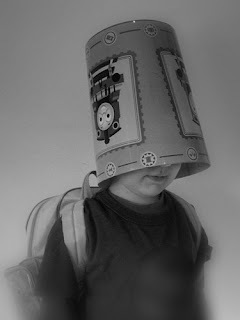 Apparently it was a durplast helmet not a Thomas The Tank Engine waste basket. And my guess of Winnie The Pooh backpack should really have been Mitrinomon Z-6 Jetpack. My mistake really. I can see that its really the beginning of the end: the start of what-would-poor-old-mum-know? That small window of opportunity to dazzle my boy children with my omniscience is well and truly over. I'm trying to remain optimistic ... but frankly all I see just now is The Dark Side. I feel sorry for the kids today...they really suffer their parents' ignorance! Obviously a 'standard issue' Z160-S/075 Durplast Helmet and Classic Mitrinomon Z-6 Jetpack? "Shazbot - Der"
When they reveal the entire "Thomas the Tank" books we will be amazed at the link this "train" has to the Wookies on Shyriiwook! Reallly Liesl how could you have ever thought it was anything other the Durplast Helmet and ditto the Mitrinomon Z-6 jetpack, honestly. Ps those ewoks were so cute though. Mate, I've kept up with a lot of the boys' interests but I've drawn the line at Star Wars, because I couldn't care less. Also Pokemon. They keep trying to tell me about Pokemons but they can't make me listen. Love it...how silly do you feel!! I think I luckily still know more about Star Wars than my son, but I dread the day when that changes! OOoh I am so glad to get back on & find this !! I sit there with an odd expression on my face I am sure, a mixture of who really cares along with why oh why of all things did they choose this !!! When it's talked about here, I have no clue. Really no clue ! The first time I ever saw a movie was with Mr McBoof a few months ago, he sat glued to the screen & I just couldn't 'get it' even when I got on Facebook begging people to help me out. Yes I did admit that. I think it is now official our children are a lost cause ! Oh, I share your Star Wars pain. My husband is a huge fan and has created the obsession in our 4 year old. Sometimes all the questions do my head in. I can cope with the original movies, but the new ones - I have no idea! Well I spotted it right away. Call yourself a mother? ?